When talk among baseball fans turns to the so-called ugly uniforms of the 1970s, the most frequent subjects of twisted appreciation are the technicolor dreamsuits of the Astros, the brown and yellow McDonald’s-cashier garb of the Padres, and the White Sox’ humiliating shorts and giant-collar shirt ensemble. 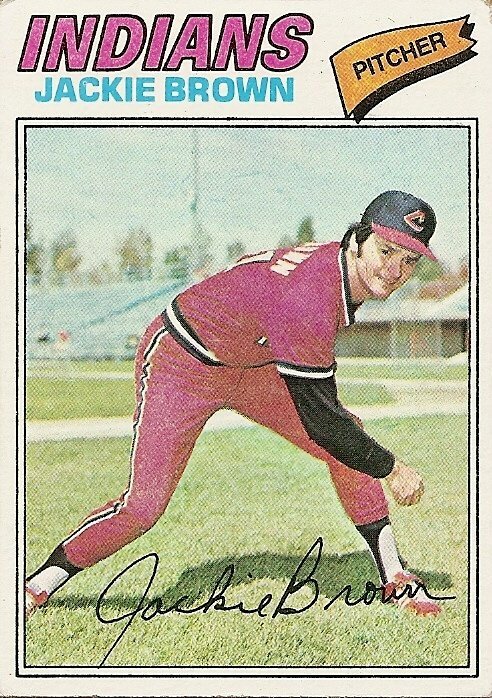 For some reason the Indians’ all-red migraine-producer fashioned here with exclamation point aplomb by drifting hurler Jackie Brown seems to generally escape the scrutiny of the collective baseball memory. I’m not sure why this is. Maybe it’s because the Indians in the 1970s were so forgettable. At least they were to me, which is odd, because the teams I was generally most familiar with were those that played in the American League East (which is where the Indians were from 1969 until the jarring and alienating invention of the Central Division in the mid-1990s). I try to think of the Indians teams from my childhood and all I can come up with is the vague notion that Rick Manning was a good fielder. They were actually not as atrocious during the mid- to late-1970s as I would have guessed, and maybe that’s another secret of their forgettableness. They just kind of blended in. (Perhaps the red uniforms were a desparate, ultimately futile attempt to demand that the world take notice.) In the season directly preceding this Jackie Brown photograph, the Indians even finished above .500, albeit just barely. According to the statistics on the back of this card, Jackie Brown contributed significantly to this rare post-Rocky Colavito breath of winning baseball: as the Topps people have it, Jackie Brown blitzed the American league that year with a near-spotless 9–1 record. Unfortunately, his actual record was 9–11; somebody lopped off a 1 in the tens place of his loss column. I wonder if the Montreal Expos brass somehow had access to this card before it even hit the stores in 1977. The idea that he was a 9–1 pitcher seems the only possible explanation I can come up with to explain the trade that occurred in December 1976 that sent Jackie Brown north of the border for budding slugger Andre Thornton. Thornton went on to be a mainstay in the middle of the Indians’ lineup for years, while Jackie Brown put in one more season that was exactly slightly worse (9–12) than the previous season before bidding adieu to the major leagues. The funny thing about the trade is that despite its lopsided nature it seems neither to have hurt the Expos, who began climbing toward the top of the N.L. West East, nor to have helped the Indians, who began plunging ever-farther down into the depths of the A.L. East. You are currently browsing the archives for the Jackie Brown category.